During the fall quarter we’ll be featuring some posts from students currently on co-op. They’ll discuss the type of work they’re doing, their experiences in a new city, tips and tricks about surviving & thriving on co-op, etc. Today we hear from Alisyn ’13. Where did the time go? As I begin my law school departure, let me introduce myself: my name is L. Alisyn Daniel, and I am a JD/MPH student. I will be sitting for the Michigan Bar Exam this coming February. My final co-op is currently underway, where I am gaining immense legal knowledge co-oping for the Honorable Judge Victoria Roberts (NUSL Alum) at the United States District Court for the Eastern District of Michigan. Co-oping in Detroit, my hometown, has been eye opening and humbling experience. Currently, the City of Detroit is seeking a Chapter 9 bankruptcy citing that the Detroit is insolvent. Conversely, Detroit city workers and city retirees are concerned that they may lose their pensions if the Chapter 9 filing is allowed to move forward. On September 19th numerous Detroit residents and retirees came to the federal courthouse to voice their opposition to the City of Detroit’s decision to file for bankruptcy. Another intern and I sat in to listen to the “people” speak. Their raw emotions, varying from sadness, anger, and distrust, were rightly compelling and undeniable. One Objector moved me with her words when she explained how she took a job with the City over 40 years ago, working below minimum wage because she was promised a pension after years of service. Now that pension is being threatened. 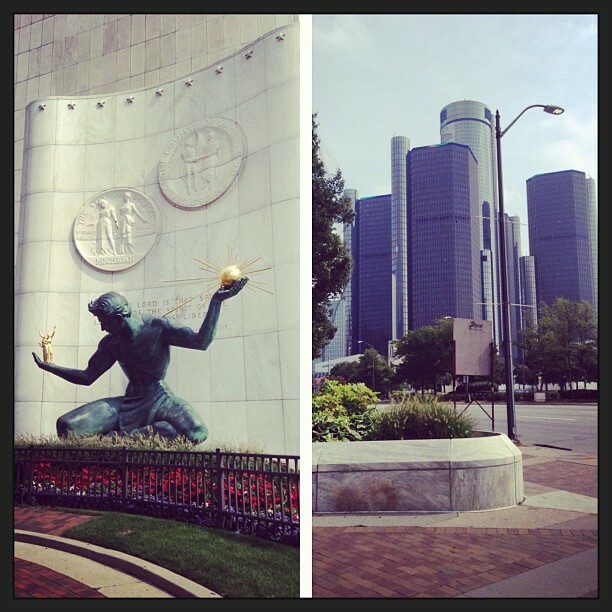 Following the hearing, I walked around the city and took a few encouraging photographs showcasing Detroit’s beauty. While this situation is wrapped in anguish and confusion, I am thankful for the opportunity to be on co-op during such a significant period in Detroit’s history. NUSL’s educational framework has equipped me with a handy toolbox of knowledge and experiences, and I am now exceedingly motivated and ready to put my acquired legal tools to work. Next stop: BAR EXAM! This entry was posted in Alisyn '13, Current Students and tagged bar exam, City of Detroit, Co-op, cooperative legal education program, Detroit, Education, judge, Law, Law school, legal education, Northeastern University, northeastern university school of law, NUSL, Student, Student life, United States District Court for the Eastern District of Michigan, Victoria Roberts. Bookmark the permalink.